Marouane Fellaini (midfielder for Manchester United and for the Belgian National soccer team) is currently recovering from a wrist surgery and is expected to be out until February. 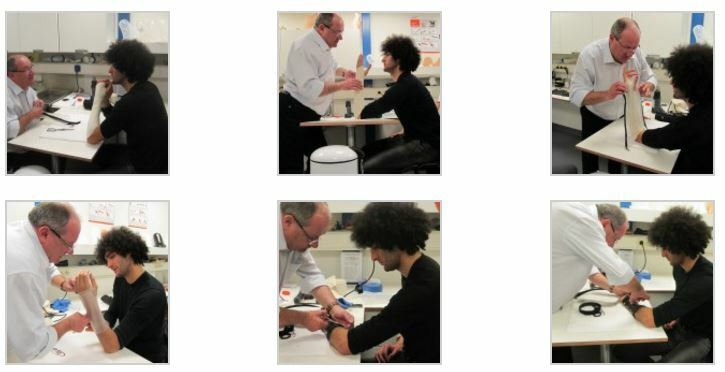 Fellaini injured his wrist ligaments in a clash against Shakhtar Donetsk during the Champions League in October, but after consulting with the medical staff and the Belgian National Team, he decided to delay the needed operation until the end of 2013. The procedure to repair the tendon scapho-lunar damage took place on December 21st . A 3rd splint made of Orfit Colors NS (color: Dominant Black), which will serve as a resting night splint. The custom made Orfit Crystal NS splint is a semi-rigid non-stick product that will give enough support without completely immobilizing the patient. The perforated nature of the splint lets the skin underneath breathe and thus allows sweating, while the transparent look and feel will make sure the splint isn’t very noticeable. These properties, along with the fact that semi-rigid splints are allowed on the field, make the splint extremely suitable for Marouane Fellaini, who will be able to play and move freely without experiencing discomfort. Also, the splint may serve as a proprioceptive reminder to limit heavy and dangerous movements. The resting splint in Orfit Colors NS is a rigid splint that will be used at night, when immobilization is needed. Fellaini’s medical staff is hopeful that the splints might shorten his recovery period with 2 weeks. He is expected to be match fit for the Champions League last -16 tie against Olympiacos on February 25th. For additional information, please contact our Product Specialist Physical Rehabilitation: Björn Leroy (Bjorn.Leroy@orfit.com). Orfit Crystal NS is the first transparent product on the market. This semi-rigid splinting material gives enough support without immobilizing the patient. Easy to reinforce if needed.